Should You Consider Creating a Post-Nuptial Agreement? When most of us think of contracts between spouses, we think of premarital agreements, but Illinois offers an alternative way to agree on how the division of property and alimony will be handled after a divorce. While you may not have felt you needed a premarital agreement before you married, there are certain events which could make a post-nuptial agreement a good way to protect your interests. A post-nuptial agreement is similar to a prenuptial agreement, in that it acts as a binding agreement between you and your spouse regarding which spouse owns certain property, which spouse is solely responsible for certain debts, how alimony will be handled, or what share of the estate spouses agree to take should the other spouse die. For many couples, money becomes a source of serious conflict. Spouses with spendthrift ways can cause anxiety for more frugal spouses. When one spouse starts their own business or returns to graduate school during the course of a marriage, they may incur substantial debts for which the other spouse does not want to be responsible. A post-nuptial agreement can afford peace of mind to couples that, should the relationship end, only the spouse who incurred a large debt will be responsible for paying that debt back. Creating a post-nuptial agreement can afford you and your spouse an opportunity to closely examine the current state of your finances, your spending or saving habits, and your priorities moving forward. These agreements can even contain terms discussing how much financial support the couple will provide to children from a prior marriage, the couples’ priorities in paying off their joint debts, what percentage of earnings will be saved or spent, and even how often each spouse is permitted to have a boys’ or girls’ night out. It is important that each spouse feels that their desires and rights are protected in a post-nuptial agreement. If one spouse feels coerced into signing an agreement that felt unfair to them, or another spouse threatened them in some way, then the agreement could be deemed invalid by the court if that coerced spouse later challenges its validity. In order to avoid the court declaring that the agreement isn’t enforceable for some reason, it is critical that both spouses have legal representation when creating a post-nuptial agreement, so that both spouses understand what rights they might obtain and give up by signing that agreement. 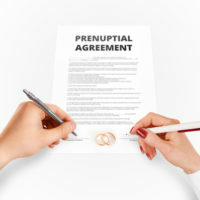 If you would like assistance creating a prenuptial or post-nuptial agreement in Illinois, contact the knowledgeable and experienced Chicagoland attorneys at Johnson, Westra, Broecker, Whittaker & Newitt, P.C., for a consultation on your case, at 630-665-9600, with offices conveniently located in Carol Stream, St. Charles, and Chicago.